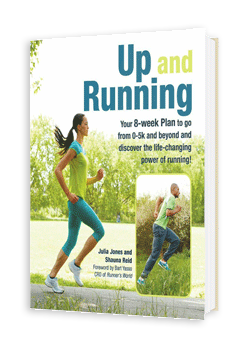 Co-authored with Julia Jones, UP AND RUNNING is an 8 week plan to go from zero to 5K and discover the life changing power of running. We’ve taken Julia’s 15+ years of coaching expertise, a tried and tested 5K plan, plus all the wisdom and inspiration gleaned from helping thousands of runners in our Up & Running e-courses… and brought it all together in this fun, compassionate and inclusive book. Find out more over at the Up & Running website.